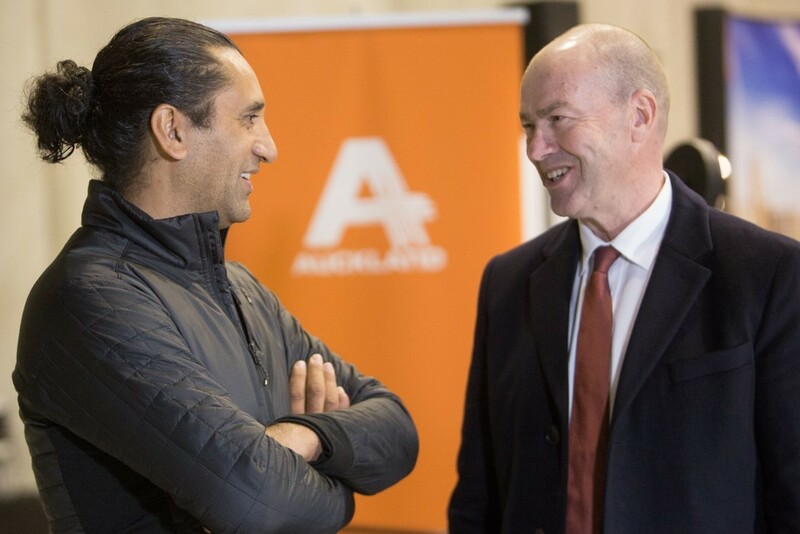 The next generation of potential producers, actors and crew from Auckland’s thriving screen industry heartland had the chance to be inspired by Kiwi star Cliff Curtis today. The actor and producer, best known internationally for his critically acclaimed roles in feature films such as Blow, The Dark Horse, and Once Were Warriors, and television productions including Body of Proof and Fear the Walking Dead, spoke to and answered ‘press conference’ questions from about 70 creative arts and performance students at Studio West, home of the long-running Power Rangers series. The students were from Te Kura Kaupapa Māori o Te Kotuku, Waitakere College, Hobsonville Pt Secondary School, Kaipara College, Green Bay High School, Kelston Girls and Kelston Boys. Curtis (Ngāti Hauiti, Ngāti Rongomai, Te Arawa), was last month named one of six Kea World Class New Zealand Awards recipients – recognised for his commitment to indigenous storytelling. Curtis will receive his award, sponsored by ATEED, at a gala dinner in Auckland tonight where the Supreme Award winner from the six category recipients will also be announced. He told the students he had flown in yesterday from Los Angeles, where he is working on several Avatar sequels, and doesn’t find it easy to explain the “freaky journey” of how he got from a 14-year-old who wanted to stay at school but had to leave and get a job, to being an international movie star. He said success comes down to a few really basic things: “Who are you, what do you want out of life, and where do you want to be? And how passionate are you going to be about getting there? And how committed are you going to be to make that happen? Curtis said he had found his sense of purpose and life meaning. “For me, it just happened to be pretending. I’m a professional pretender”, whether that was to be a Latin gangster, a chess player, a CIA or FBI agent. He urged the students to not let other people define them or set parameters in their lives, whether that be family circumstances or people telling them they couldn’t do it. As a Kea Global Partner, ATEED created the opportunity for students to engage with and learn from Curtis, multi award-winning film and TV production and costume designer Tracey Collins, Tearepa Kahi (Ngāti Paoa, Tainui) – a filmmaker best known for Poe-E, The Story of Our Song, and his work on Hunt for the Wilderpeople – and Jared Rawiri, an accomplished actor who plays 'Mo' on Shortland Street. Nick Hill, ATEED Chief Executive, says the region’s screen industry hit $1 billion gross revenue from production last year, and it supports more than 6800 jobs across more than 1700 businesses – mostly in Auckland’s west (these include world class animation, post-production, special effects and prop manufacturer companies). “Cliff is a fantastic example of how young creative people with passion, energy and commitment can go on to achieve career success, both locally and internationally. Along with Tracey, Tearepa and Jared, Cliff can inspire our rangatahi to follow their dream and contribute to our region, and our country’s world class screen industry,” says Nick Hill. Curtis’ latest big screen movie, The Meg – which was filmed largely at Kumeu Film Studios and on the seas around Auckland – is slated for worldwide release in August. Those credits add to a career where he has starred alongside Hollywood legends such as Morgan Freeman, Denzel Washington, Al Pacino, Arnold Schwarzenegger, Anthony Hopkins and George Clooney. Curtis’ first production company Whenua Films (formed with cousin Ainsley Gardiner) produced Taika Waititi's Eagle vs Shark, and Boy – which stood as the highest grossing local film in New Zealand history for six years – and a number of successful short films. His other production company Arama Pictures continued his commitment to indigenous storytelling – including executive production of The Dark Horse. “I am just one person in our industry. There’s a lot of people that stand around me, behind me and in front of me to make what I do possible. Nothing happens with me in this business without the support of a lot of other people,” Curtis said, thanking his wife, children, and wider whanau. Curtis continues to alternate producing local stories with acting roles in Hollywood, having amassed more than 50 credits between producing and acting in TV, theatre and film.